Aruba, Australia, Bahamas, Caribbean, Cayman Islands, Chile, China, England, Haiti, Honduras, Israel, Germany, Jamaica, Korea, Mexico, New Zealand, St. Thomas, Trinidad, Turks & Caicos, and Switzerland. 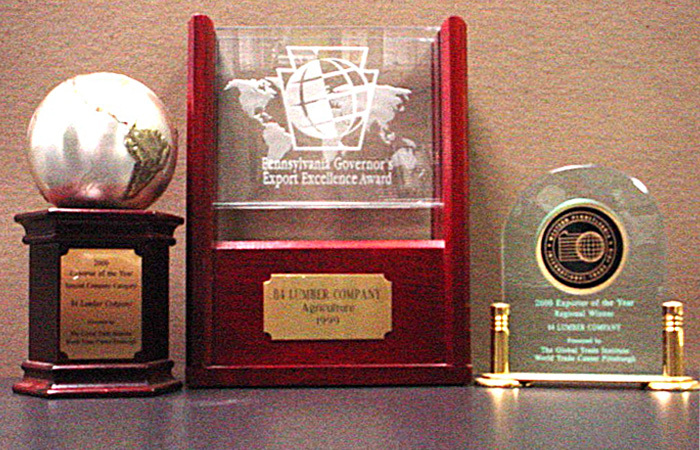 Member of Western Pennsylvania District Export Council. 84 Lumber shipped 36 luxury homes to Shenzhen, China in 2000. We also supplied the oak spiral staircases, Jacuzzis, In-wall vacuum system, and appliances such as refrigerators, ovens, washers and dryers, etc. Our efforts also included on site technical assistance. 84 Lumber made several trips to Berlin, Germany. We supplied 36 town homes. We also worked with the Burgomasters to ensure our quality work met the local codes. 84 worked with builders in Joju, Korea on this development, sending over blueprints and building sixteen American-style wood framed houses. We have served in over 6 major projects in Korea, and plan for more in the future. 84 Lumber provided Puebla, Mexico with various building materials for agricultural projects. We supplied lumber, roof trusses, fasteners and steel mesh for concrete cellulose insulation. 84 Lumber has shipped over 8 agricultural projects to Mexico in the past 3 years.